We are pleased to share that we have exciting news for you that ServiceWear has a new cooperative contract with National IPA and TCPN. ServiceWear Apparel has been awarded a contract for “apparel, uniforms, accessories, products and services” by National IPA through lead agency Region 4 Education Service Center in Houston, Texas. More details on our transition will be forthcoming in the weeks ahead. We’ve created a service model built exclusively to fulfill the needs of government agencies and nonprofits. This contract will continue to make available the biggest brands in workwear, designed expressly to meet the rigors of the broad range of needs by those in public service: Red Kap, Horace Small, Bulwark, Wrangler Workwear, and Chef Designs, all manufactured by VF Imagewear, the largest manufacturer of work apparel in the world. Over 16 million people go to work in VF Imagewear manufactured products each week. We want to express our gratitude to U.S. Communities for their assistance the past seven years. And while our current U.S. Communities contract will expire at the end of this year, our customers can rest assured that they can continue to rely on the same great service, pricing, and product selection they’ve come to expect from ServiceWear without interruption. We are grateful for the opportunity to be of service to our valued customers across the United States and look forward to continuing these relationships in the years to come. Please don’t hesitate to contact me if I can be of any assistance to you and your agency. Congratulations to the 2015 Park Ranger of the Year Winner! Congratulations to Cpl. Brandon Bartz, park ranger at Dr. Edmund Babler Memorial State Park in Missouri, the official 2015 Park Ranger of the Year winner! In a remarkable rescue, Cpl. Bartz made a treacherous 140 feet climb up a rock wall to rescue a woman with several internal and skeletal injuries. His brave and selfless actions represent what it truly means to protect and serve. Cpl. Bartz wins the grand prize of $1,000 cash, plus an additional $1,000 worth of apparel for his park. Read Cpl. Bartz’s winning nomination. Congratulations are also in order to runner-up, Tracy King of Bull Shoals -White River State Park, AR who will receive $500 in apparel for his park. Tracy’s emergency response skills, thorough resource protection efforts and leadership have served the Arkansas State Park system for over 30 years. Thank you for your resounding participation with this award. We received 60 nominations and over 7,000 votes and were honored to share the stories of these hard-working park rangers. Watch for more contest opportunities from ServiceWear Apparel. In the meantime, we will continue to equip state and local parks with high-quality uniforms and work apparel. Browse our selection of products for parks, then click here to get started and learn how you can access over 70,000 styles of park apparel. Last Chance for 2015 Pricing! Now’s your chance to SAVE! All orders now until December 31, 2015 for any of our high-quality uniforms and work apparel will receive our 2015 pricing. Order now to take advantage of 2015 prices on top brands and products. Contact Customer Service to get started or call 1-800-578-9023 anytime. As always, there’s no contract necessary, so stock up now on uniforms and apparel for your crew! Your favorite finalist needs your support to win that $1,000 in cash and $1,000 in apparel for his or her organization, so invite others to vote! It’s easy. Simply share the finalists page or the voting page on your preferred social media platform or via email to spread the word for your favorite nominee! We suggest reaching out to friends, family, co-workers…anyone and everyone! Nominate your favorite Park Ranger for 2015 Park Ranger of the Year! ServiceWear Apparel announces the 2015 Service Spotlight Park Ranger of the Year Award. The Service Spotlight Awards were established to shine a light on those unsung heroes serving our communities that often go unnoticed. Today we seek to honor a park ranger who goes above and beyond in service to his or her state park and community. Nominations can be submitted now through November 13, 2015 at www.servicewearapparel.com/ranger. The winning park ranger will receive a $1,000 grand prize and $1,000 worth of uniforms for his or her state park. Runner-up will receive $500 in uniforms for his or her state park. The nominator with the winning submission will also receive a free Red Kap® Soft Shell Jacket. ServiceWear Apparel will select a group of finalists based on criteria outlined in the contest guidelines. Then online voting will open from November 19 to December 4. The winner will be announced December 8. For more information on the 2015 Park Ranger of the Year Award, visit www.servicewearapparel.com/ranger/ or contact info@servicewearapparel.com. ServiceWear Apparel announced Jason Parker, correctional officer of the Westville Correctional Facility (WCC), as the 2015 Correctional Officer of the Year. The award honors a correctional officer who goes above and beyond the call of duty in service to his or her facility and community. Officer Parker’s nomination by administrative assistant, David Leonard, placed him as a finalist. After conducting a nationwide vote over the internet, Mr. Parker was the overwhelming choice, winning a $1,000 grand prize, plus $1,000 worth of apparel for Westville Correctional. Officer Parker has served the Indiana Department of Corrections for over 14 years managing work crews, overseeing high-security transports and maintaining safety for everyone who steps foot on the premises of WCC. You can read Mr. Parker’s full winning nomination, as well as those of the other finalists here. Sgt. Dennis McGill of Edinburgh Correctional Facility earned the runner-up award and will receive $500 in apparel for his correctional facility. For more information on the 2015 Correctional Officer of the Year Award, visit servicewearapparel.com/correctional-officer/ or contact info@servicewearapparel.com. Westville Correctional Facility was converted from a state mental health hospital to a prison in 1977. It is situated on over 200 acres in La Porte County, and contains minimum, medium and maximum security units. Nearly 3,400 offenders are housed at WCC, and over 2,400 are returned to the community annually from WCC. ServiceWear Apparel announces the 2015 Service Spotlight Correctional Officer of the Year Award. The Service Spotlight Awards were established to shine a light on those unsung heroes serving our communities that often go unnoticed. Today we seek to honor a correctional officer who goes above and beyond in service to his or her correctional facility and community. Nominations can be submitted now through July 3, 2015 at servicewearapparel.com/correctional-officer/. The winning officer will receive a $1,000 grand prize and $1,000 worth of uniforms for his or her correctional facility. The nominator with the winning submission will also receive a free Red Kap® Soft Shell Jacket. ServiceWear Apparel will select a group of finalists based on criteria outlined in the contest guidelines. Then online voting will open from July 13 to July 24. The winner will be announced shortly after voting ends. For more information on the 2015 Correctional Officer of the Year Award, visit www.servicewearapparel.com/correctional-officer/ or contact info@servicewearapparel.com. The ServiceWear Apparel Contract has been extended! We are proud to announce our competitively bid contract with the City of San Antonio has been renewed! You can continue to piggyback off the contract for uniforms and work apparel to take advantage of our exclusive benefits and guaranteed best pricing through U.S. Communities. Review the original contract and the contract extension yourself, and then jump into our 2015 Price List. In case you weren’t aware, the ServiceWear Apparel contract with U.S. Communities allows government agencies like yours to purchase uniforms with no bid process required. Learn more here. As always, contact Account Management anytime by email or at 1-800-578-9023. We look forward to doing business with you in 2015. Last Chance for 2014 Uniform Pricing! Now is your opportunity to save! 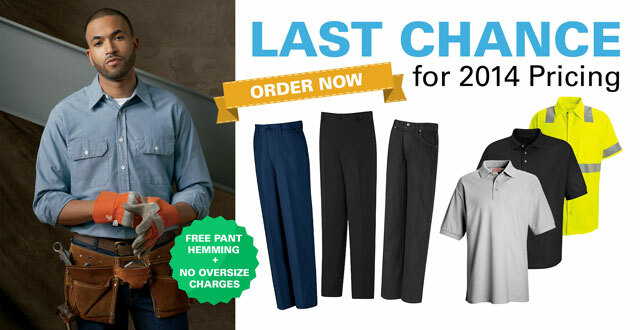 All orders now until December 31 for high-quality uniforms and work apparel will receive our 2014 pricing. Order now to take advantage of 2014 prices on top brands and products. Contact Account Management with any questions or call 1-800-578-9023 anytime.